A Big Step Towards Operations – Platform Sailaway from South Korea and Commissioning Gas into the Plant at Bladin Point. Louis Bon joins Petroleum Club NT in March for the first time since 2015 to share an Ichthys Project update. With Ichthys now at 90% complete, 2017 is a pivotal year to complete construction and transition the Project towards safe and steady operations. The Ichthys LNG is the World’s Most Amazing Project. Come along for a rare deep insight into how this amazing project is reaching its final stages of development and what’s in store for the 40-year operating phase. 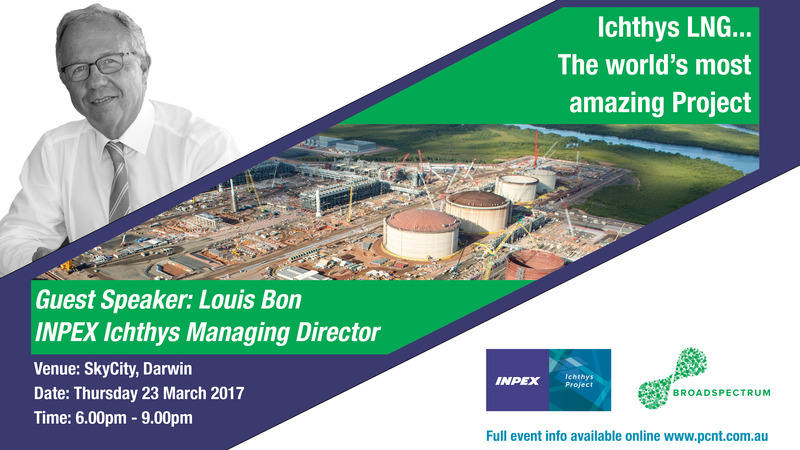 Louis Bon is the Managing Director of what is regarded as the largest, most complex construction project in the world at this time and will take us through an exciting journey to deliver Ichthys to operations. Tickets include 2 course meal and beer, wine and soft drinks.